There are some big decisions to be made when it comes to decorating the house. The color scheme you use in each room will have a big impact on how it feels. How can you know what color will go best in each room? Luckily, the psychological effects of color have long been the subject of study by the finest minds. From Aristotle to Leonardo da Vinci, it seems everyone has an opinion! Today, we have contemporary science to show us the way. For example, we know that green is an excellent choice for the study or office, because it stimulates creative thinking. For example, the ‘Fresh Sage’ shade promotes a feeling of tranquility and intellectual engagement. On the other hand, a carefully selected shade of red will lend a lively, sociable atmosphere to your dining room. It’s the perfect color if you want your dinner parties to go off with a bang. 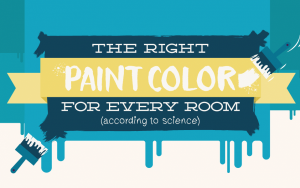 For expert advice on which colors work best for each room, have a look at our new infographic. It identifies the effects you can get color by color, room by room. Decorating is a great opportunity to create an environment where you’ll love to work, rest and play. Pick your hues carefully, and you’ll soon create your dream home. Questions to Ask Your Home Builder Homeownership: Opportunity is Knocking!